It’s been really helpful to hear feedback from colleagues & the community about the Mozilla Event Menu (see [Version 0.2](http://michellethorne.cc/2012/01/mozilla-event-menu-lite/)), and here’s a shoutout to Gianfranco for his thoughtful input & article about the menu [on Conference Basics](http://www.conferencebasics.com/2012/01/event-menu-mozilla/)! We decided to go for the **Holy Triple. ** The menu should be streamlined and simple. There are places to share all the other crazy formats in development (see below), but when people come to Mozilla for the first time, having clear calls to action help. Importantly, we **removed the fireside chat** from the core offering. I think this decision is keeping with our philosophy of interactive events (you’ll have more decentralized conversations at a meet-up than in a fireside chat). Plus we continue to face technical challenges to online discussions. We also **omitted the Mozilla Festival,** as it’s not (at least at this time and in its current format) an event that an organizer would come across and run on their own. Other changes in this version include **a clearer call to action:** “What do you want to organize?” and an **invitation to hack the menu. ** We always planned for the menu to be bendable to suit an organizer’s appetite, but including an explicit invitation to do so is more with the Mozilla spirit and hopefully helps people see this tool as a guide, not a prescription. With [William Quiviger](http://somethin-else.org/) from the Mozilla Reps program, we talked about **iconizing information** like prep time, participant size, and estimated cost. I still think this is smart information to include, but failing good design, I wasn’t able to work it in without distracting from the menu. Perhaps the next version can play with those elements. Very keen to hear your thoughts on this! 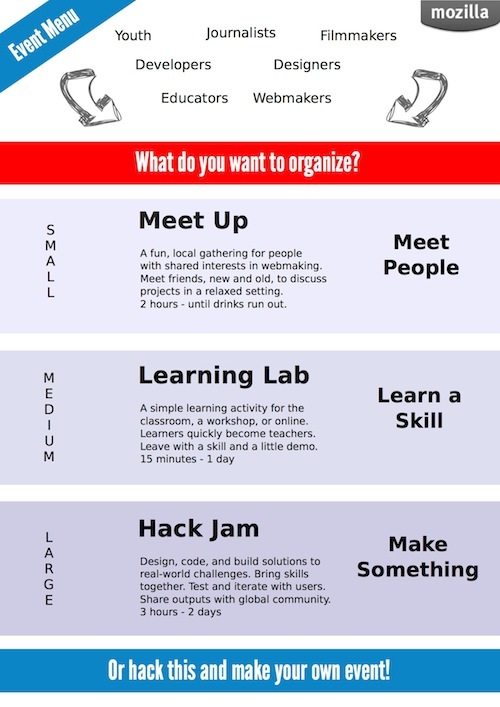 Seeing the success of the Hive Pop-Ups, most recently in [Tokyo](https://commonspace.wordpress.com/2012/01/24/every-event-is-a-laboratory/) and forthcoming in [Toronto](https://torontoyouthhackjam.eventbrite.com/), we’ve talked about **how to better offer additional event formats** that may not be our core calls to action, due to complexity, resources required, and other reasons, but still very powerful and templatable. 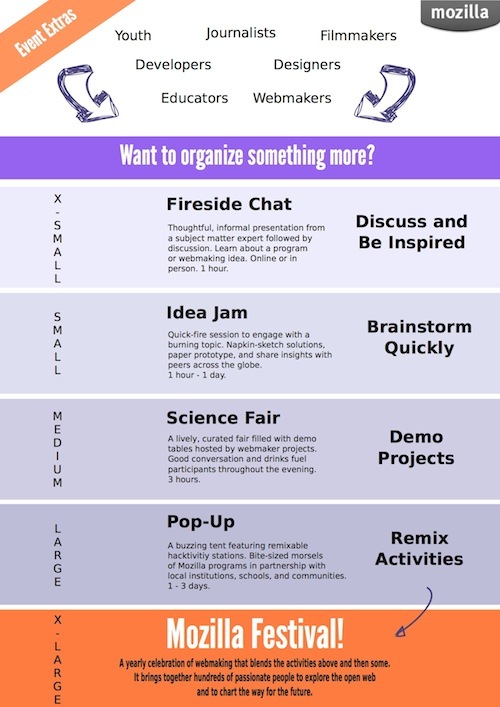 The extras include: fireside chat, idea jam, science fair, pop-up, and the Mozilla Festival. In the meantime, [Laura Hilliger](http://www.zythepsary.com/techie/more-system-thinking-at-a-micro-level/) is leading efforts to **adapt the Hacksaurus Hacktivity Kit and our event resources to P2PU**. The platform is home to a learning community that could help share and vet these resources, plus build in the peer-to-peer mentoring model we hope to grow towards. Laura is also thinking deeply about how to overlay Mozilla’s webmaker curriculum onto the event menu, which is quite exciting. As this loooong post shows, there are lots of places where the input from experienced organizers and community members would really help focus and improve these efforts. **We’d love to hear from you** if this is on track, and if these tools help serve your needs!